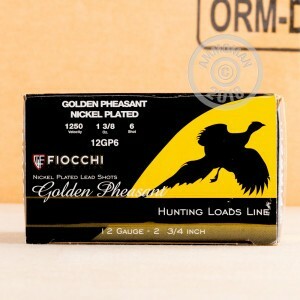 Take a few boxes of this Fiocchi shotshell ammo on your next pheasant or turkey hunt and enjoy reliable performance against large game birds. Each 2-3/4" shell in this box of 25 fires 1-3/8 ounces of #6 shot at 1,250 feet per second and produces terminal ballistics out to medium range. This ammunition uses nickel-plated shot for tighter patterns and penetration to help you make clean kills at a distance. 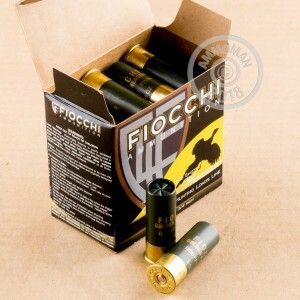 Fiocchi shotshells are loaded by Fiocchi of America in Ozark, Missouri. 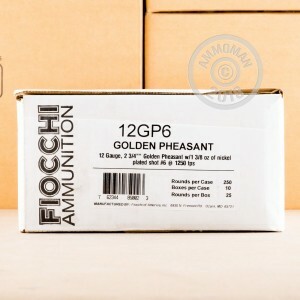 Stock up for hunting season with free shipping from AmmoMan.com. All orders over $99 ship for free regardless of package weight!